You know by now that I like that drive out to Caledonia, Illinois, right? Caledonia presents sweet little surprises around every bend in the road. The agricultural diversity in this area blows me away. Once again the weather tried to keep me home where it was warm and dry. HA! I scoffed at gray sky, rain, and wind. I laughed in the face of this fifty degree, soggy May, day. I gassed up the Guzzler and set out to visit another farm. I drove my route singing along with Tony Rice and Ricky Skaggs, tapping my foot, drumming the steering wheel. It is not physically possible to listen to good bluegrass and stay still or be sad. (Remember that on a bad day.) The fields I passed were freshly plowed and the rain made them look like neat rows of chunky chocolate. Illinois has some gorgeous black soil. It’s no wonder Chicago is surrounded by farmland. 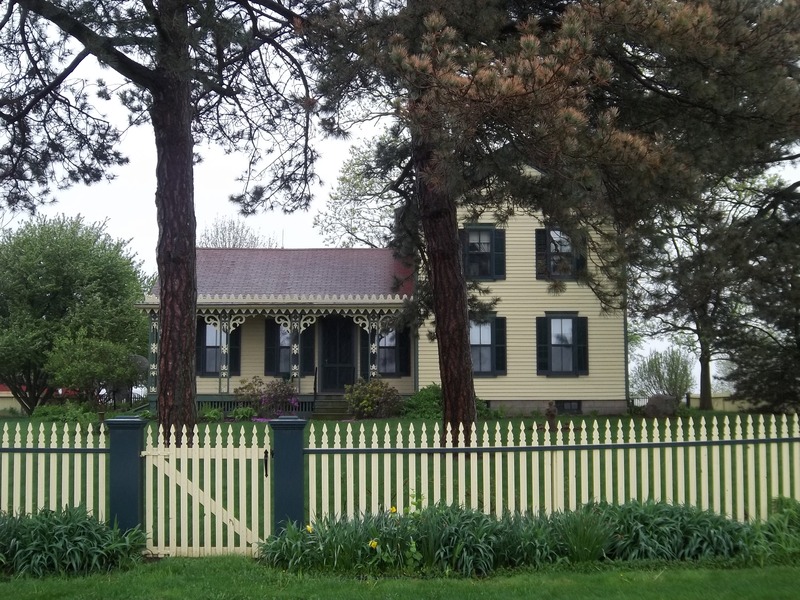 The little slice of heaven I visited today was the McEachran Homestead at 1917 Wyman School Road in Caledonia. (It is pronounced Mc-eck-ran.) I saw a state “Tourist Attraction” sign pointing the way toward the farm. Wyman School Road tilted up in front of me and in half a mile I was over the rise and found the Homestead on the right. The gingerbread house is yellow and surrounded by a yellow picket fence with at least a million pickets. 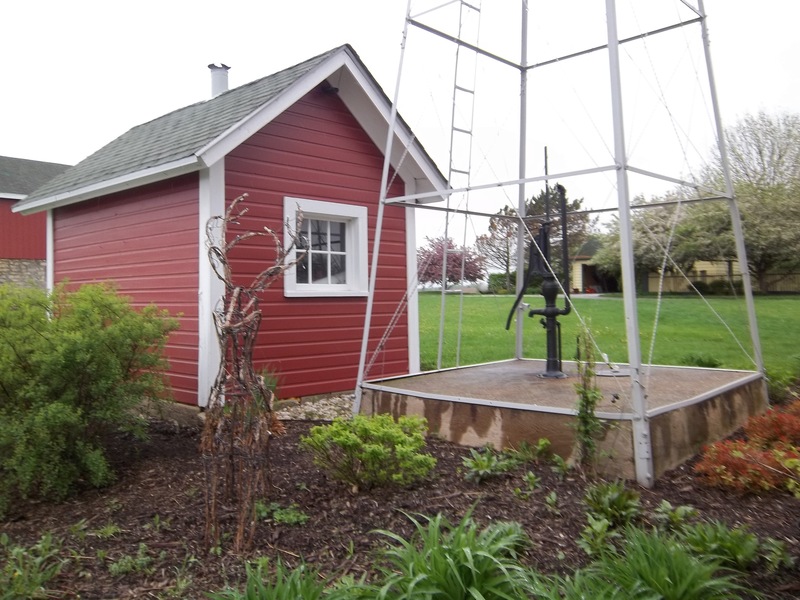 There was a red barn with a beautiful, tiled silo at the corner, a windmill, and a small dirt parking lot. This farm is so cared for that it almost looks like a movie set. The grass was emerald-green and it was being cut in the rain when I arrived. The barns and outbuildings the perfect barn red, the stone foundations sturdy and handsome. The landscaping was very attractive. Someone has an eye for color and structure. 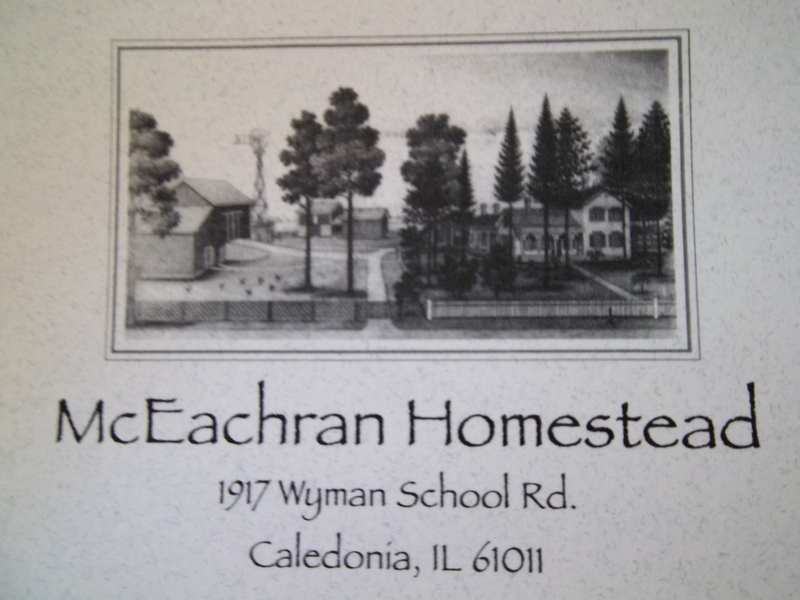 The state of Illinois has designated the McEachran Homestead a sesquicentennial farm. I had to look that term up – I quizzed my friends at dinner last night and we all agreed there was a “hundred” involved, but the “sesqui” got us. (Note to Mama: I know now that it means 150 years.) Then came the delicious little surprise! It’s a real winery. The vine gods smiled upon me today, friends! I grabbed the story tote that holds my pens, pencils, notebook, and camera and stepped out into the drizzle. I took a couple of pictures; a red barn door, a grapevine deer, a windmill. I walked around the stone path to the entry at the back of the main barn, where I was greeted by Doctor Herbert Greenlee and Penny. “Doc” is 83 and grew up on this farm. His great-great-grandparents came from Scotland in 1836 and bought this land in 1837. A group of Scottish immigrants who were farmers came along about the same time and the area was known as the Argyle Scottish Settlement. (That is a story in itself and I will follow that thread one of these days.) Dr. Greenlee’s great-grandparents settled the farm and built the house in 1859. He grew up on the land and his love and respect for it are in the delightful details. The main barn contains the tasting room and professional kitchen below, and an attractively restored dining/party room upstairs. Dr. Greenlee gave me a tour of the upper level. There is a lot of old wood, big beams, red walls, and nice views of the vineyard, gardens, and house from the windows. The restoration makes it feel old and contemporary at the same time. There are enlarged, black and white photographs on the red walls showing family and farm history. Dr. Greenlee left the farm for a career as a surgeon at Loyola Hospital. When he retired he came back to farming and decided to preserve this piece of Scottish American history. Thank goodness! It is one of the few remaining intact parcels from the Argyle settlement. 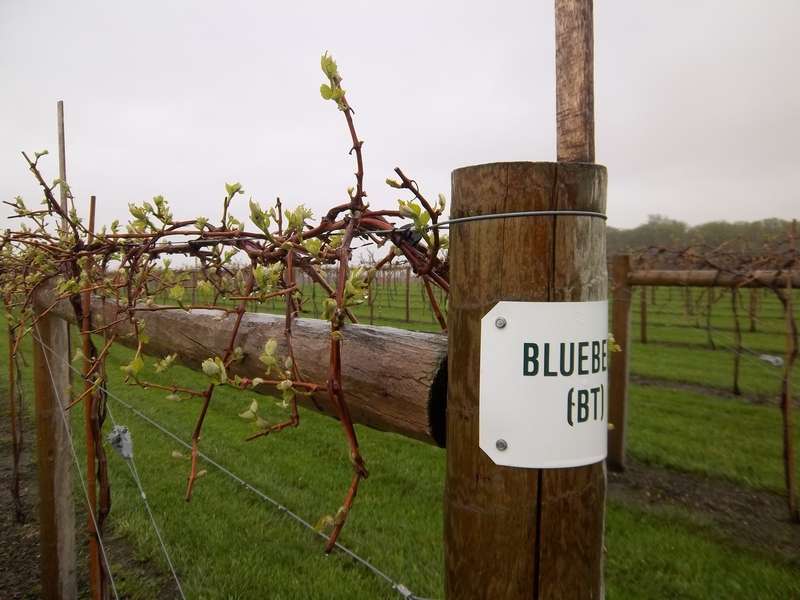 We looked out the windows, and Dr. Greenlee told me they have planted 19 varieties of grapes. He gets out there every day and helps the team with the vines. He said he planted a few grapes when he retired and found that they just keep coming and you have to DO something with them… so he made a little wine. We went back down the wooden staircase and Doc turned me over to Penny. Penny hung out with me for about an hour and half and told be about the wines, what they want to do on the farm, and let me taste a half-dozen wines. The lower level of the barn is very clean. The stone walls and beam ceiling make it cozy. There were gourds hanging from the rafters to dry and displays of farm goods for sale. When I arrived a group of four women were sitting at a round table, talking softly and tasting wine and they were there for most of my visit. The stainless steel kitchen is open to the tasting area and I enjoyed watching the dinner prep for a party of 14 as Penny and I talked. Penny lives nearby and until last fall worked at Wind Ridge Herb Farm. (Remember the Poison Garden article, my first farm blog post? That was about Wind Ridge.) Penny was fun and smart and I enjoyed her company. She is Sue’s assistant. Sue is the winemaker and enthusiasm for her craft is catching. She used to teach science at Winnebago High School and now applies her scientific knowledge to fermentation and fruit and sugars. This is a good thing, if the wines I tasted today are any indication. Penny introduced me to Tammi, who has been around the place for 14 years. She started as a part-time gardener and now seems to run the tasting room/party side of the operation. I say “seems to” because everyone there wears a few hats and pitches in, so it’s hard to define roles precisely. Everyone does what needs doing. Tammi sat with me for a while and talked about the farm, the people, the chores, the kitchen, the dinner for fourteen she was helping to prepare for this very evening. Tammi and Penny agreed that grapes are like children; they need training and will run wild if you let them. Both Tammi and Penny offer their input as Sue creates wine. They tell her “It needs a little more bite,” or “More honey.” They work well together. All along, as we talked I was tasting wine and I admit I was pleasantly surprised. Before I describe the wine, let me say that I have enjoyed wine for 30 years or so… and I have been in a Chardonnay/Cabernet rut for a while. I busted right out it today. What a refreshing change! I thank my new friends for waking up my taste buds. St. Pepin is a crisp, bright, nearly sparkly white wine. I tasted grapefruit, pear, a bit of lemon, though it’s not tart. There was some hint of a mineral in there, too. The complexity was a pleasant mystery I am still pondering hours later at midnight. Next came the Steuben Rose’. I am not, ordinarily, a fan of Rose’ but I liked it well enough. It was bright and cheerful and it wanted me to have Havarti with it, I think. Then I tried Highland Sunset, a blend of 3 grapes described as a “sweeter red.” I really, really liked it and it was very well balanced. I was not struck by sweetness at all. It made me think about sitting on the front porch my sister’s house in the North Carolina mountains, and it would be a fine red to sip while watching a highland sunset. I plan to take a bottle next time I go and test that theory. Frontenac came next. A hearty red, but easy on the palate. It wants beef stew, or venison, with winter and snow. I got a hint of rich, ruby port in that one. Last but not least, Red Raspberry. Yes, red raspberry, grown right there on the farm. Shockingly raspberry, surprisingly bright and light and fun. I did a little shopping before I left. Wine tasting does loosen the purse strings! I bought two bottles of St. Pepin and 2 bottles of Highland Sunset at $16 per bottle, including tax. John and I had the St. Pepin with a baked chicken dinner tonight. He added pineapple to the list of fruits in this bright white and once he mentioned it I realized I had missed it. I am saving the red for that porch in the mountains. 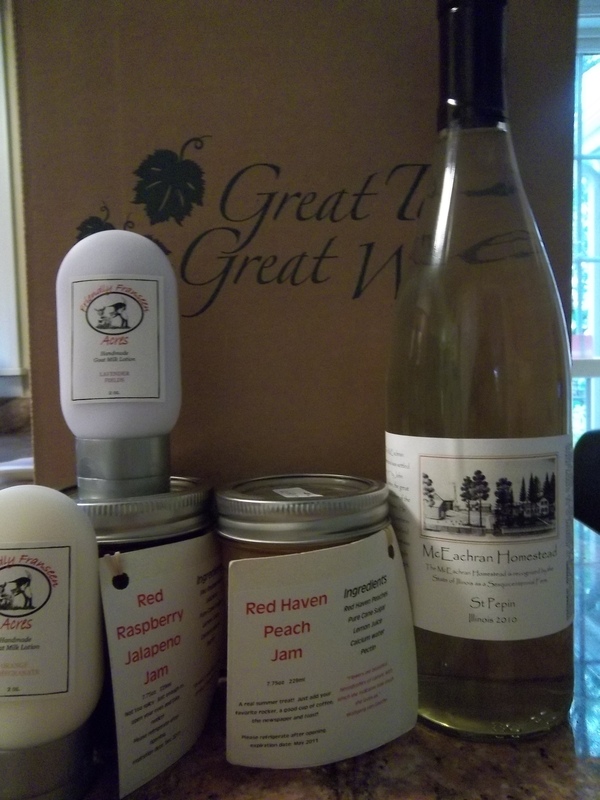 I picked up some of the homemade jam from the farm; Red Haven Peach and Red Raspberry Jalapeno, both made by Tammi. The peach is chunky, sweetened with cane sugar and is going to make one heck of a biscuit topping! It’s a mouthful of summer and I love it. I have not tasted the Red Raspberry Jalapeno yet, but I am thinking lamb chops topped with it instead of the old mint jelly standby. Pepper jellies are also really yummy with cream cheese on crackers, or as Penny recommended, an English muffin. I also picked up some handmade goat milk lotion made at a nearby farm, one called Lavender Fields and another called Orange Pomegranate. Both smell good enough to eat. The McEachran Homestead Farm is now a little over 200 acres, the majority farmed by someone else who is growing corn and soybeans. The wine and party business is supported on 11 acres of land where they grow grapes, rhubarb, asparagus, melons, strawberries, and beans, among other things. If you wish it you may have a private party upstairs in the barn. (I wish it!) The staff will prepare dinner with food grown on the farm and pair it with wines. Dinner includes a talk by Doc Greenlee about the history of the farm and a hay ride in a tractor drawn wagon if the weather permits. 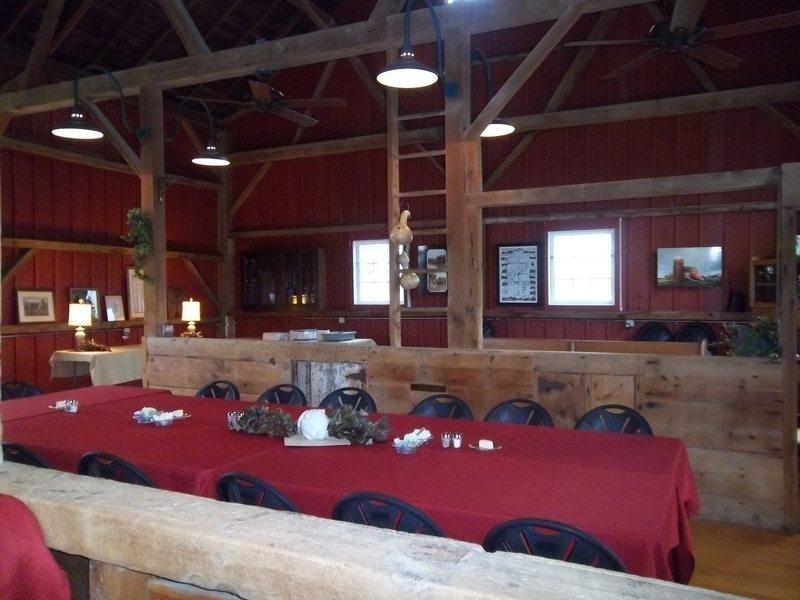 There is a six person minimum for dinners and the barn can hold up to 50 guests for parties and weddings. You may use your own caterer for larger events, or let the team there take care of you. You need to call ahead and make reservations and let them know if you want the wagon ride around the farm. (I do!) Dinners are held from May until November. The barn is cold in winter so it’s closed to parties, but the winery is open all year round, except on Sundays. Before I left, Penny and Tammi showed me a book about local history. It was called “The Art and Times of Professor William Stanley” and it contained drawings of local homesteads by the Professor, and essays about each homestead. The picture on the McEachran wine label is a pencil drawing from the book. Apparently, Professor Stanley traveled and stayed with the local farmers in years past. His payment for their hospitality was a pencil drawing of each farm. Penny said she heard Professor Stanley took a bit longer to complete drawings on the farms where the woman of the house was a good cook! The drawings are excellent and there are some originals still in the homes around Caledonia. This summer, outdoor tables and chairs will be added to the winery. If you click on the McEachran Homestead link in the menu to your right, you can take a virtual tour of the farm in summer. (I seem to get stormy, gray days lately, so my pictures don’t do the place justice.) I bet you will be able to picture yourself sitting there with friends on a June night under the Burr Oaks, watching the lightning bugs and sipping a cold glass of Red Raspberry. See you there. You do write a picture, Mary!!! Thank you so much, Jennifer! I get joy from it, too. Hooray for Highland Sunset red wine while viewing a highland sunset from my porch! Come on up and I’ll take you there! I’m going to take Mom and Dad when they come! I think this is my favorite of your farm stories so far…perhaps the subject matter has something to do with it (hic!). Superb writing also, but that’s the case with all of your stories. The apple wine was fabulous – so different and perfect! OK, WE ARE GOING! I can’t wait to see all this myself! Thanks for writing it up for us – keep on gasing up that guzzler and pioneering our awareness of a new (old) world for us to savor! Hi, Mary – what a wonderful post! (As well as your follow-up post.) I currently work at McEachran Homestead and am trying to revamp our online presence. Would you mind if we maybe featured some of your lovely photos on our website or Facebook page, with credit/a link? Or any excerpts with credit/a link? Please let me know. Feel free to email me at cara.ballard(at)gmail.com. Thanks! I don’t mind at all! Sorry for the looong delay in responding!